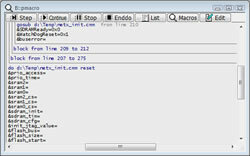 All commands can be entered by the keyboard, the function keys or with the mouse. Windows of any size can be created and positioned anywhere on the screen. In each window there is a horizontal and a vertical scroll bar. 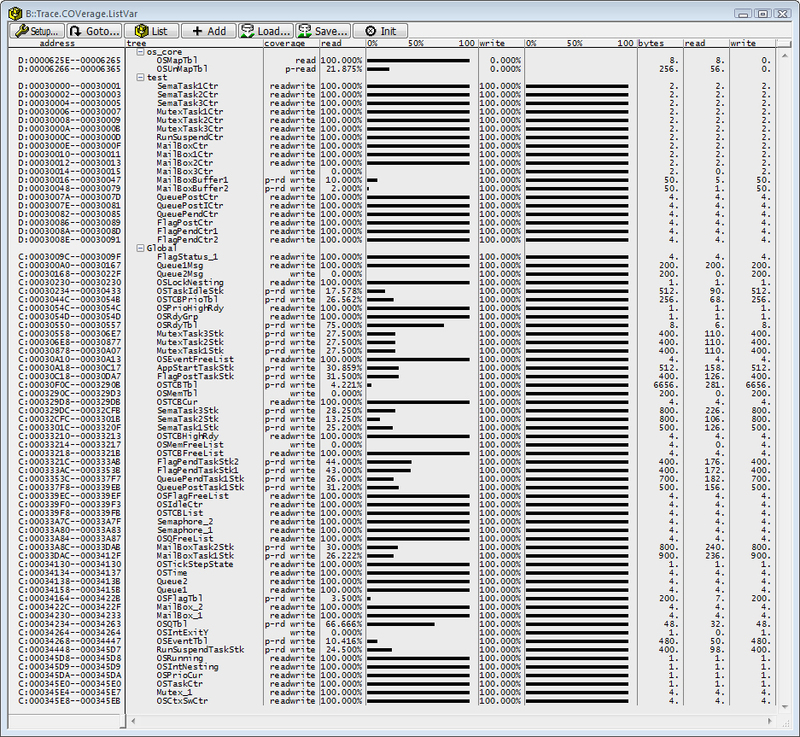 Up to 128 windows may be open simultaneously. 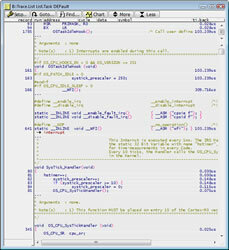 Windows may either be static (contents fixed), dynamic (contents variable) or temporary. 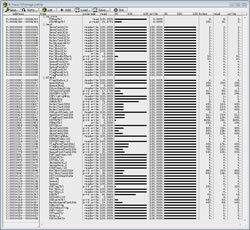 Dynamic windows are updated at a rate of up to 300 times per second. 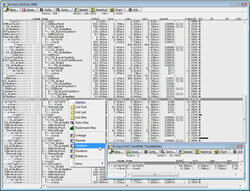 Workstation based software uses the same graphic elements like the host operation system. 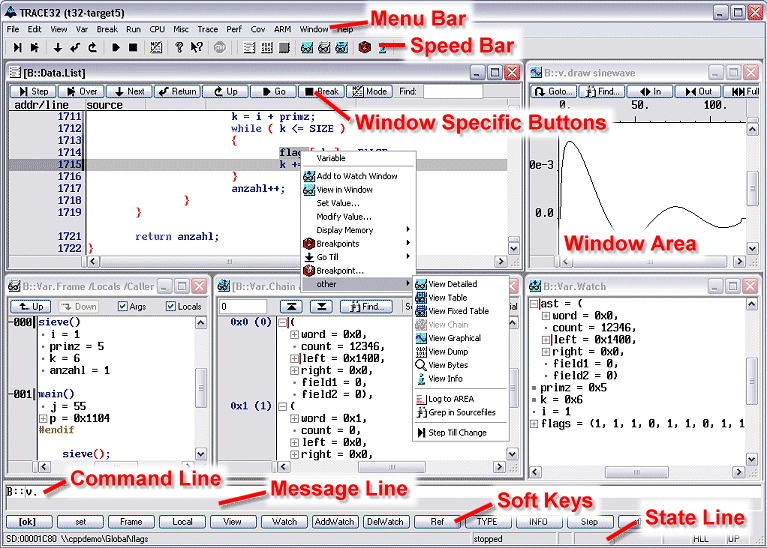 Each window configuration that the user designs can be saved for later reuse. 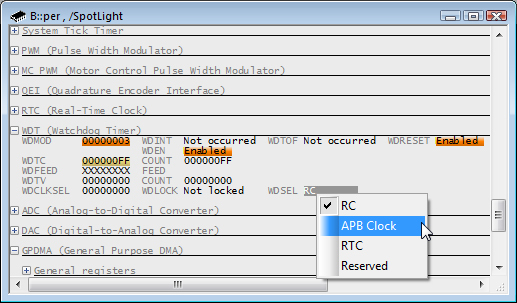 Several user predefined configurations can easily be selected from the keyboard by switching the window pages. 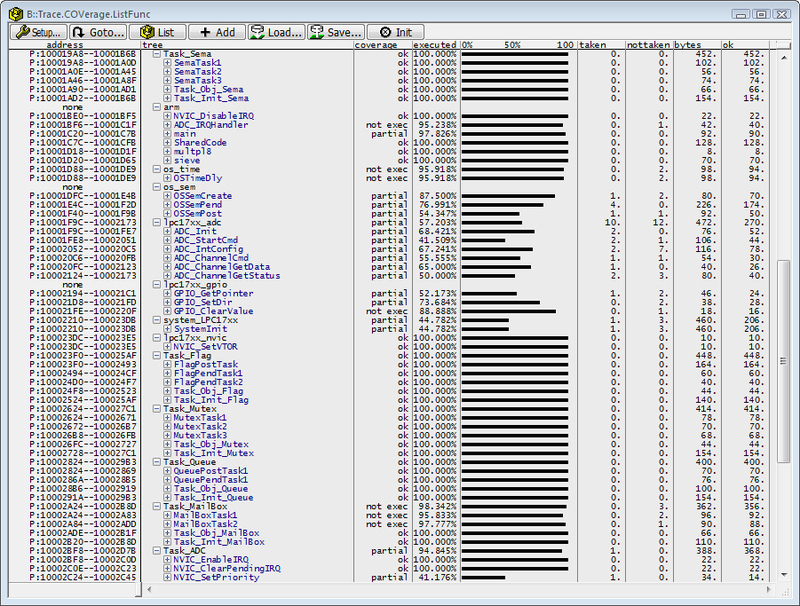 A powerful Debugger for debugging Practice Programs is included. 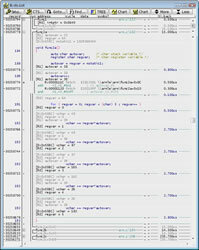 Especially for testing of Prototypes, Trace32 serve a lot of Functions and Commands. 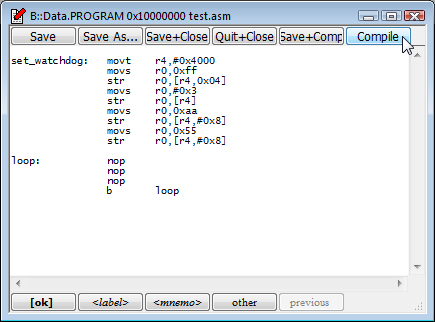 A built in Page Assembler can be used for create small Test-Code directly in the Target. 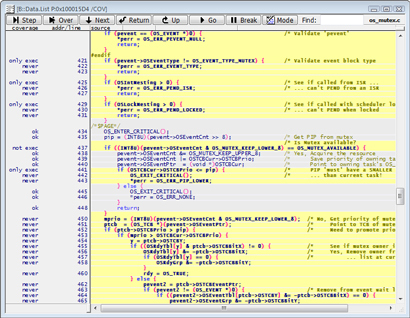 The Page Assembler is used on the same way as a editor writes in a Document. 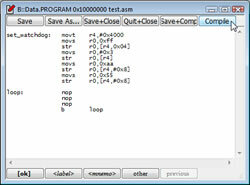 The Compile Button generates the Assembler-Code to the Target. Different Commands are available for create Patterns to the Memory or for Memory Test's. 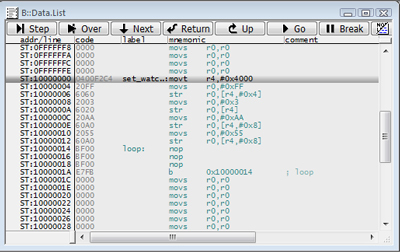 The Command can generate exactly defined CPU-Cycles in endless loops for measurement with Oscilloscopes or Logic-Analyzers in the Target. The complex Peripheral Parts of the Device is handled by a powerful Peripheral Window. The Window shows the Status of the Peripheral content and refresh the Data continuously. 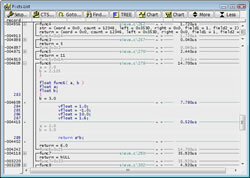 The Window is used for show and change the Peripheral on Bit Level. 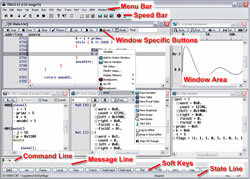 The Window is defined with a special Language and the Engineer can create additional Windows (e.g. 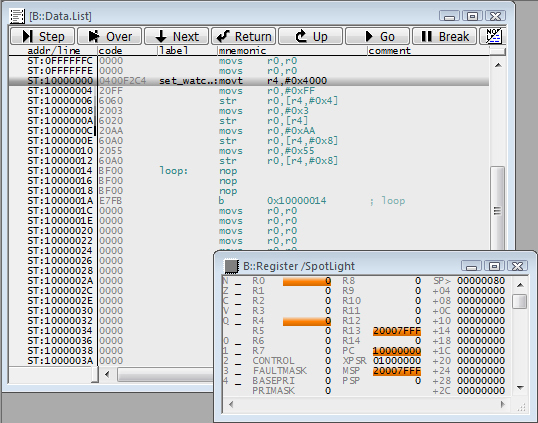 for FPGA) himself. 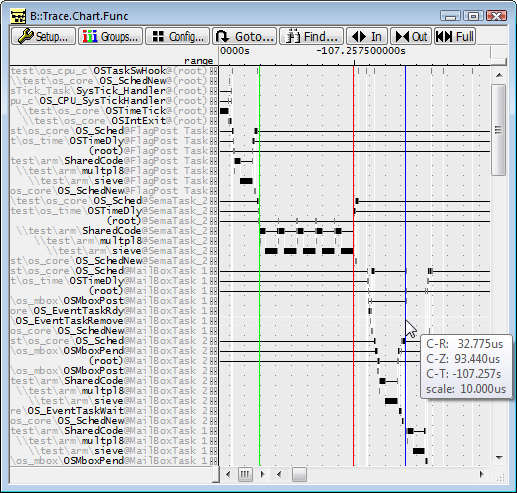 Trace32 supports programming of parallel and serial Flash devices in different technology (NOR and NAND). 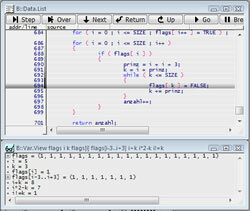 C, C++, JAVA, PASCAL, PL/M, ADA or MODULA2 Debugger with very flexible handling of Variables. Every Object in the Window can be change by simple Mouse-Click. Show quickly Values by click to the Object in the Source-Window. 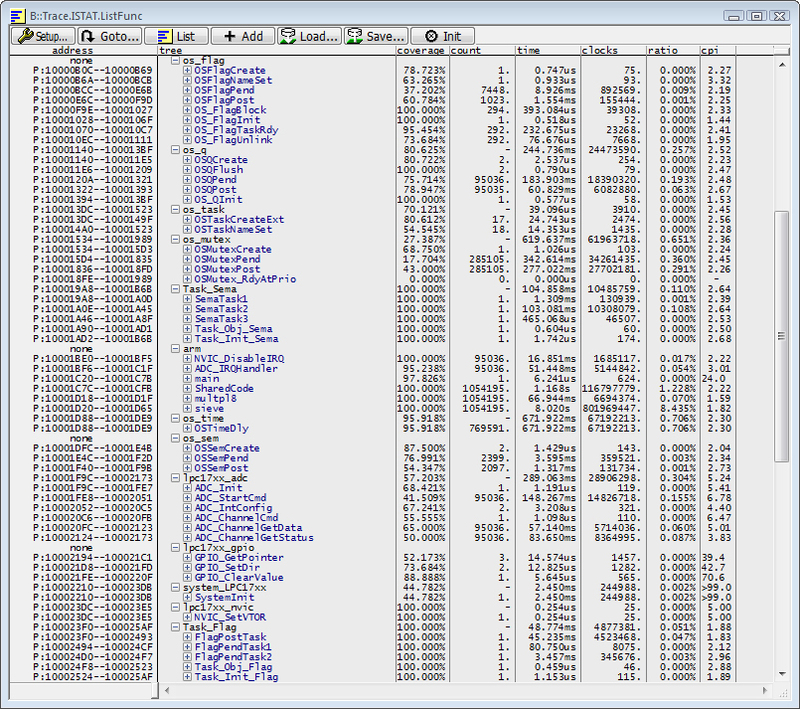 Create multiple additional View Windows with complex Objects and Terms. 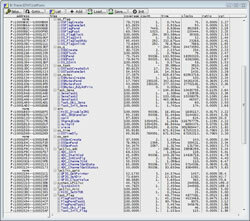 Special Windows for Table or Linked List's. Graphic Display of Arrays. 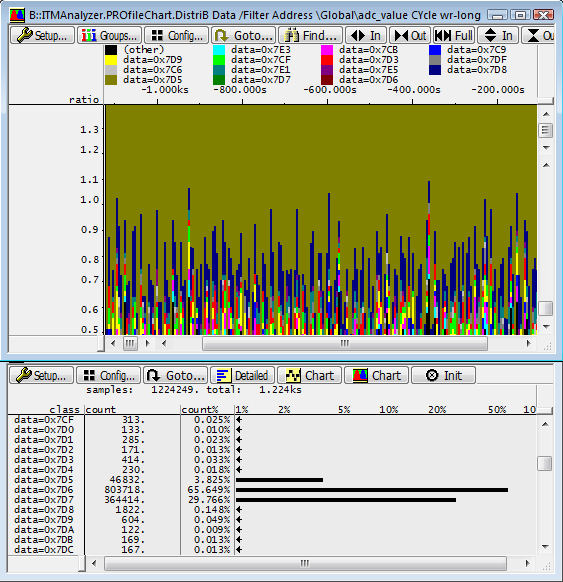 Scaled Variable View (e.g. the Value of a AD-Converter can convert and scaled for Display as a mVolt Value). 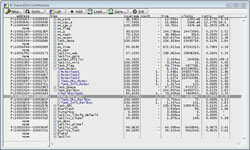 Free Format of Displayed Objects. Go to Read/Write Access on Object by a simple Mouse-Click. 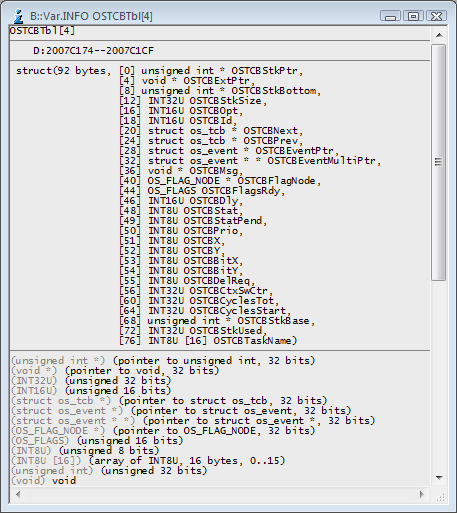 The Command-Parser supports 64Bit C Syntax. 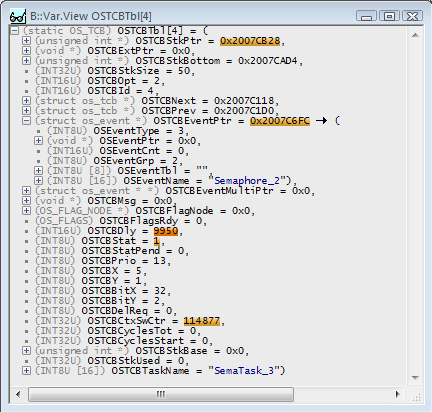 The Access to Struct's or C++ Object works on the same way as in the Language. 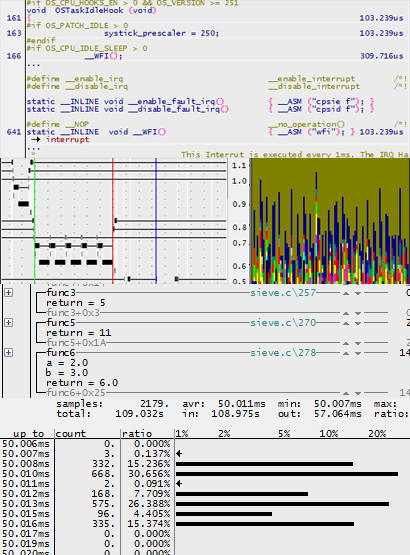 Debugging support for Asymetrical [AMP] Multiprocessor and Symetric [SMP] Multi-Core / Multi-Processor Targets. 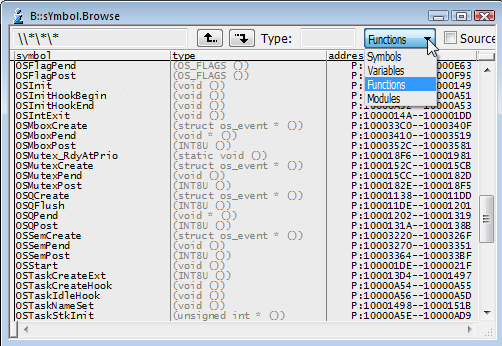 A important part of the Debugger is the Symbol-Browser. With the Browser, every Object of a Project can be access on a easy and quickly way. 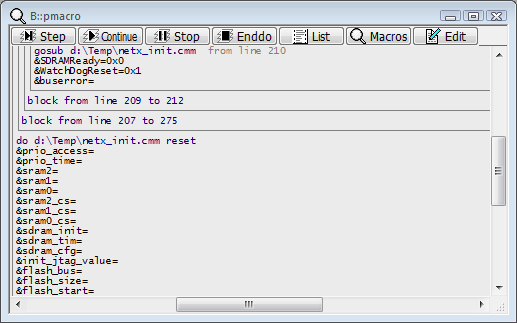 The Command-Line Parser use the Symbol Browser in the background for filling the Parameter automatically. Large Projects can be separated with free defined Group's. 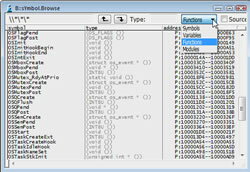 Every Group have a Color and can optional remove form the Symbol-Database (e.g. Kernel ). 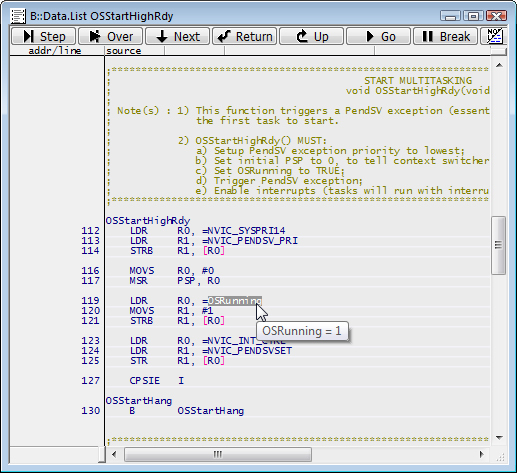 All local Variable of each Functions are displayed and can change with the Mouse. 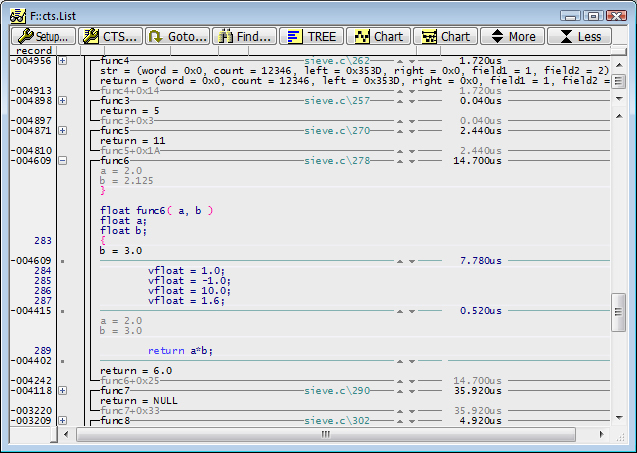 Very flexible Window for create free calculation with Variables. 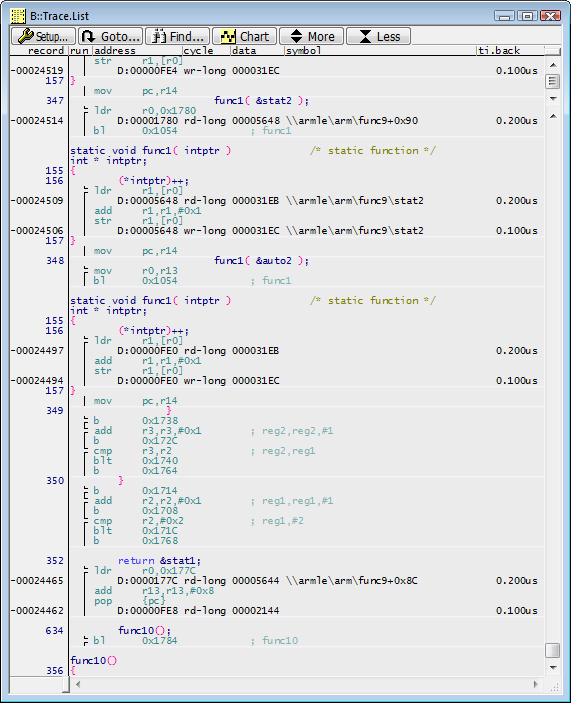 Display of a Linked-List with some Struct-Pointers. 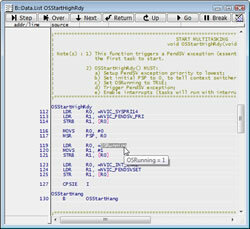 Optional enabled is the display of the Type Information. Lauterbach offers different Trace Systems for On- and Off-Chip Trace. 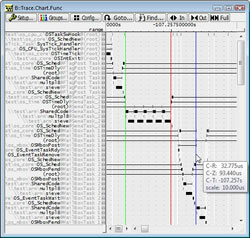 Bus-Trace, Parallel and Serial Flow-Trace Systems for the most Devices on the Marked. The Trace-Hardware supports the highest Speed and have a automatic Adaptation to the Target Timing. 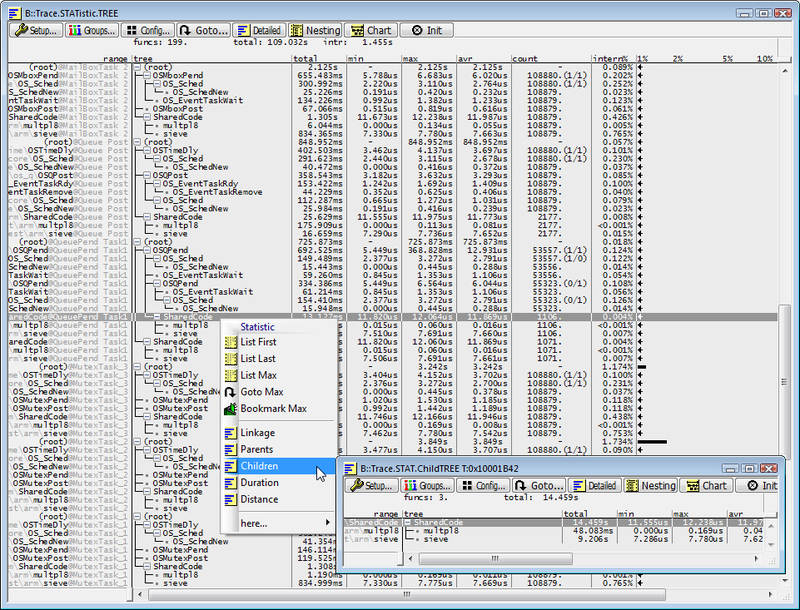 The Universal Trace-Memory can be scale from 128MByte up to 4GByte or, is used as FIFO for endless Streaming to Host (for slow-Speed Devices only). The traced Data can be analyze in very different and powerful way. 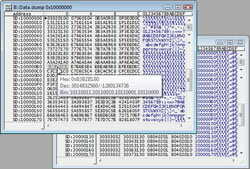 The Focus to the Traced-Data is define from Assembler-Level up to Task-Level in Listing- or Chart-Windows. Free placed markers, directly in the source, can be used for create Time-Measuring-Points (e.g. 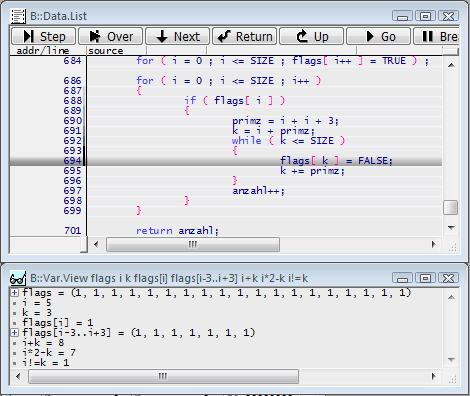 for Loop- or Code-Reapeat/Runtime analyzing).This measurement, include the placement of the Markers, is done after the Code has traced. In the past it was necessary to spend a lot of time analyzing the trace listing in order to find out which instructions, data or system states had caused malfunctioning of the target system. 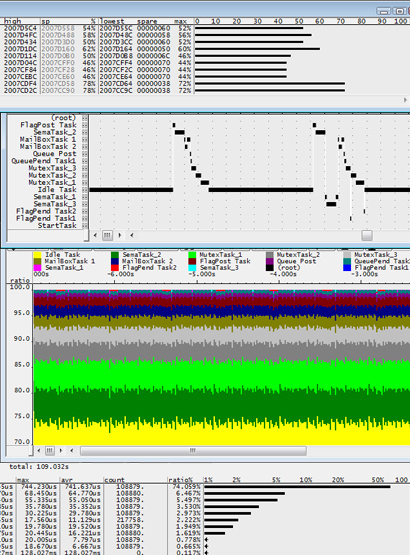 Now Trace-based Debugging - called "CTS" - allows recreating the state of the target system at a selected point based on the information sampled in the trace buffer. 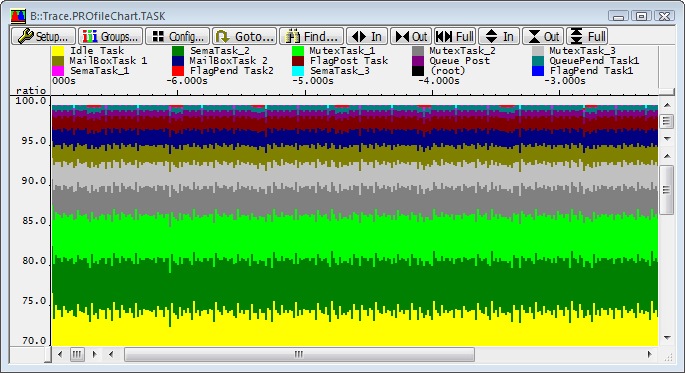 From this starting point the program steps previously recorded in real-time in the trace memory can be debugged again in the TRACE32 PowerView. 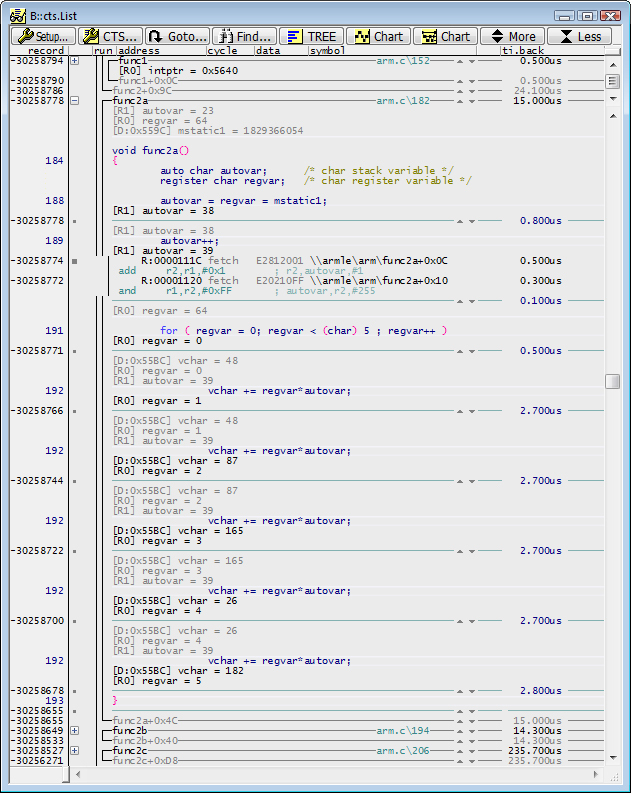 A lot of Functions are available for create Statistics over the traced-Code or Data. 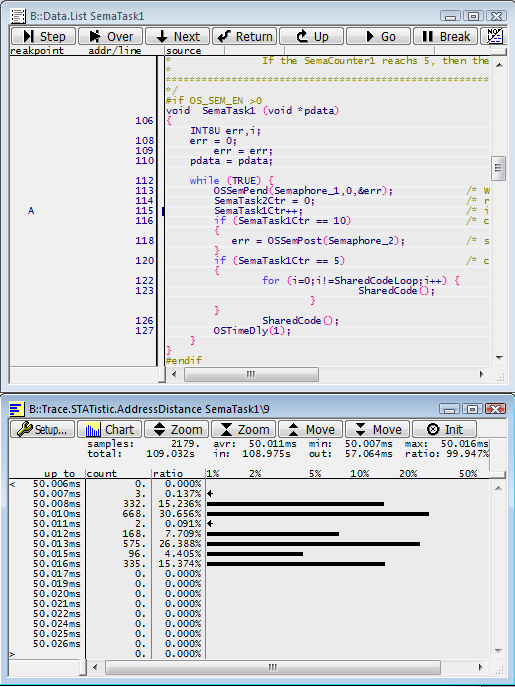 Powerful Chart and Draw Windows are helpful for analyze Code-Timing or Data-Flow. All Trace-Systems are time correlated to the other. 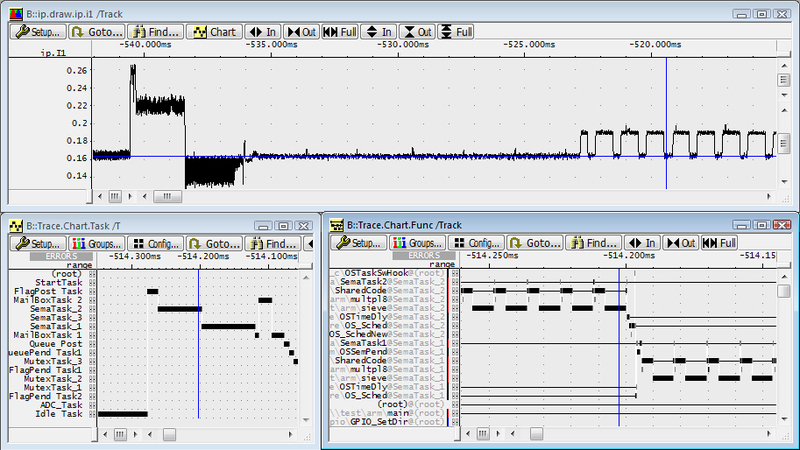 Is a Timing-, Logic- or Protocol- Aanalyzer attached, then the Trace Memory of each System is time-correlated. 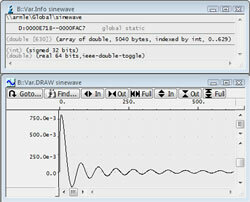 A Mouse click in a Trace-Data-Window will positioned all other Windows to the same Time-Position. 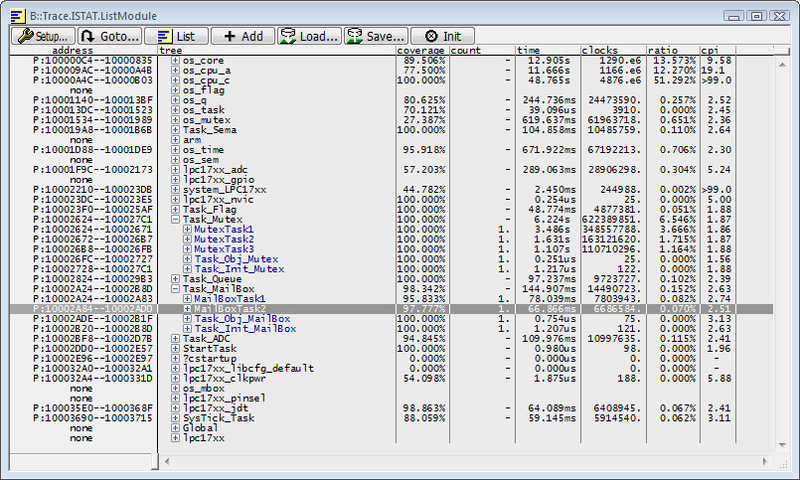 A very important part of a Debugger - Trace - System is the Kernel Awareness. 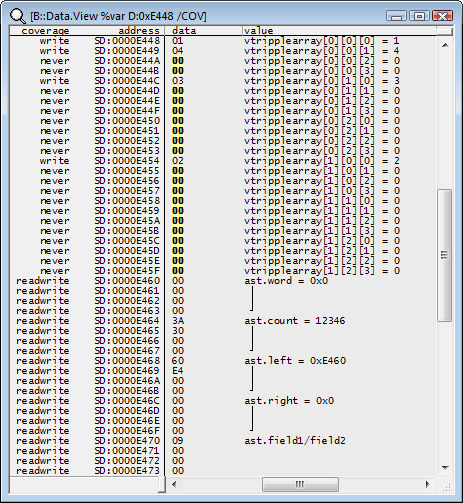 With this Extension, the Tool can understand the Kernel activity. The Lauterbach Kernel-Extension have the advantage, that it not influence the Target in any way. 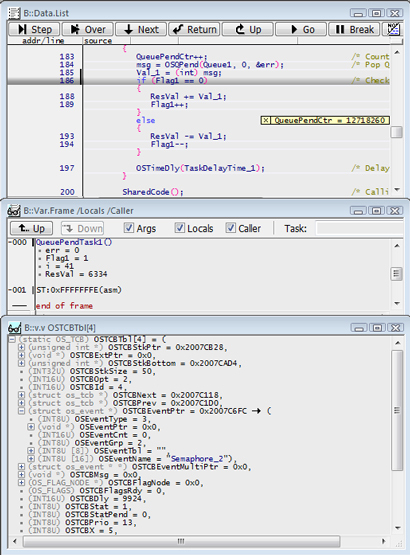 In Target with MMU's and dynamic Memory allocation, the Kernel awareness supports the Debugger-MMU and relocate the Symbols to the location of the Process. 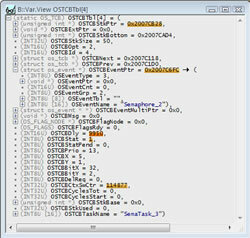 Different Windows shows the Status of the Kernel, and the Event- Objects. 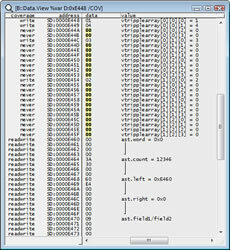 In the case, that the CPU-Device supports Live-View, the Kernel Awareness use the Trace32 Hardware for refresh this Windows up to 100 times per Second. Important for all nesting based Trace-Functions e.g. 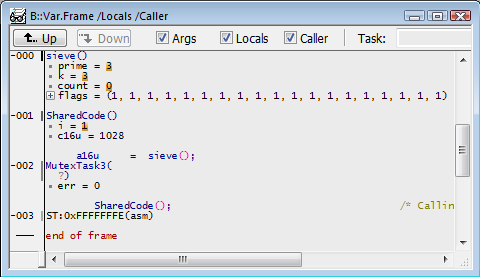 Function Statistic or Function Call-Tree or Call-Chart Windows, the Debugger must be see the Task Switches. This is a additional, important Job of the Kernel-Awareness Extension. 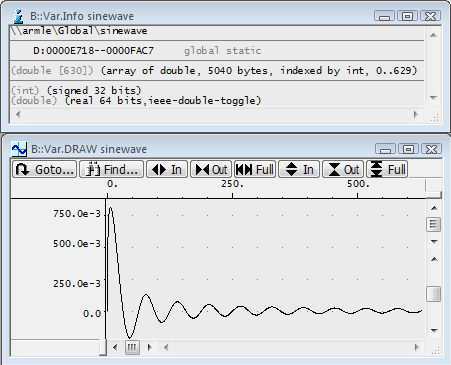 All Example on this Page are made with uC/OS-II on a Cortex-M Device. 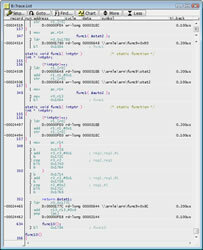 The Kernel-Status-Windows are different for other Kernels. 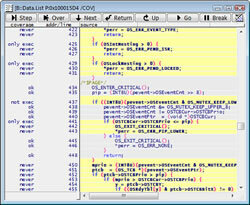 The Result of a ADC is stored in a static Variable. 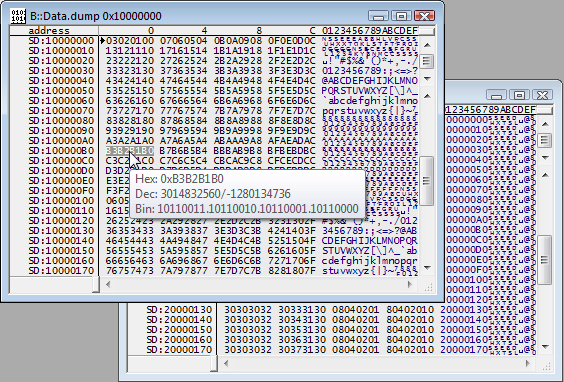 All write access to this Variable is traced. 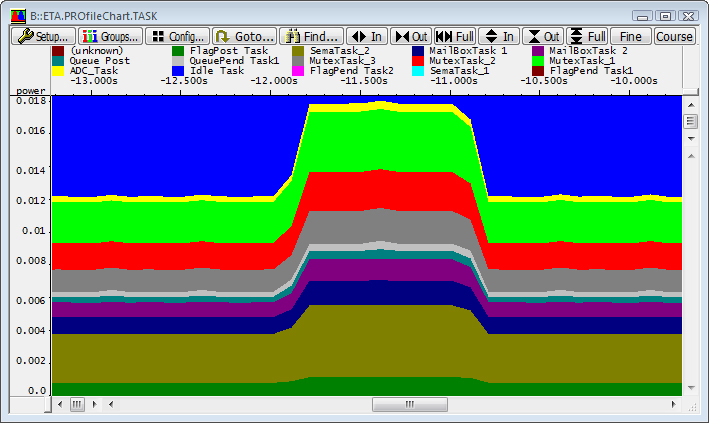 The upper Window contains the Result-Distribution over the time. The lower Window display the Statistic Result of the same Data. 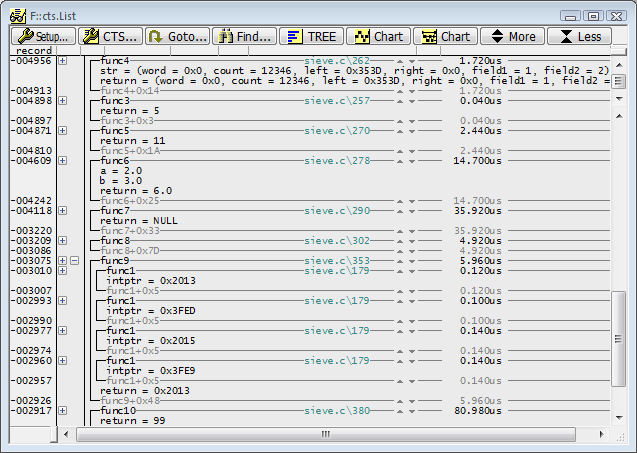 Function Tree with Timing Statistic in a Traget with Kernel. 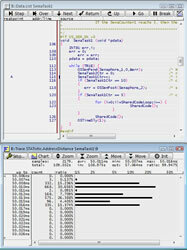 The Code and Data-Coverage is very helpful for test and check your Project. It gives the Answer to the Questions "Is my Code tested completely". 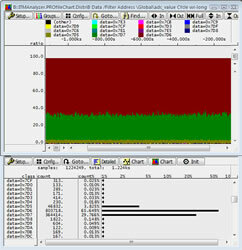 Depending of the Device, Trace32 offers C1- Code and Data Coverage. 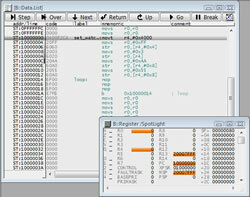 The C1-Code Coverage is a Post-Trace Operation or, if it possible, a Hardware Based on the fly Operation. 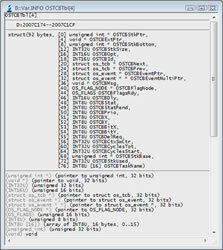 The C1-Technic generates a exact Database over the Executed Code and Read/Write Operation to the Memory. 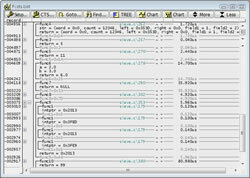 The additional Instruction Statistic Coverage is a Trace-Post Analyzing and shows the count, and used Time for each HLL-Line. 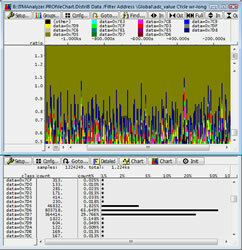 It is helpful for Bug-Finding and Performance-Analyze. ok = the code is complete executed, if() was true and not true. Reducing energy consumption is becoming more and more important for the development of battery powered devices. Characteristics such as stand-by or operating time are crucial for the operation of equipment like mobile phones. Hence comprehensive measures for reducing energy consumption are an integral part of designing battery-powered devices. However, an optimal reduction of energy consumption can succeed only if the software that controls the equipment consistently exploits all possible power-saving features of the hardware. Energy is the product of current, voltage and time. 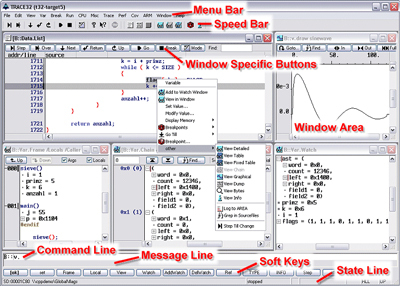 Each of these parameters can be influenced by the control software. Is the microcontroller in the right power-saving mode ? 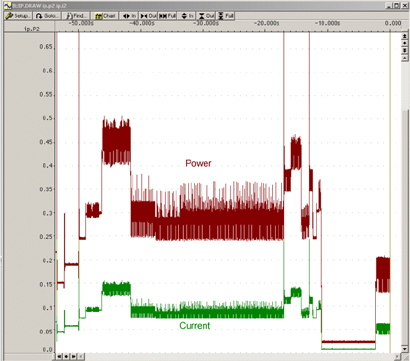 How do program changes affect power consumption? Are there any in expected power peaks? This kind of checks require a test set-up that measures, records and analyzes the program and data flow of the control software as well as current and voltage gradients. 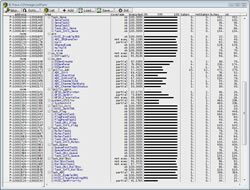 Additionally all these recordings have to be related to each other in a simple way. At the Embedded World 2007, LAUTERBACH as the first manufacturer worldwide presents a powerful and easy-to-use solution addressing these issues. 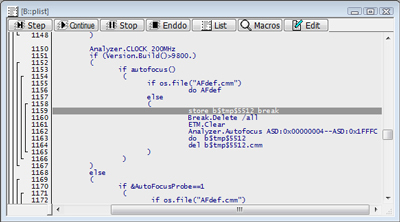 and the Function - flow on the lower right Window. Power consumption statistic in a Tree view. 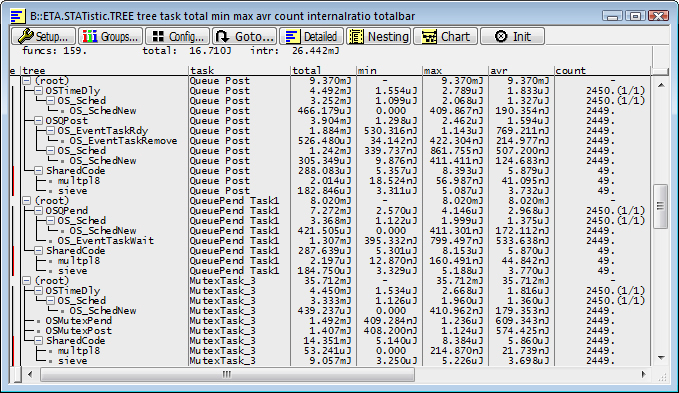 Power consumption statistic in a selected Tree-Child. 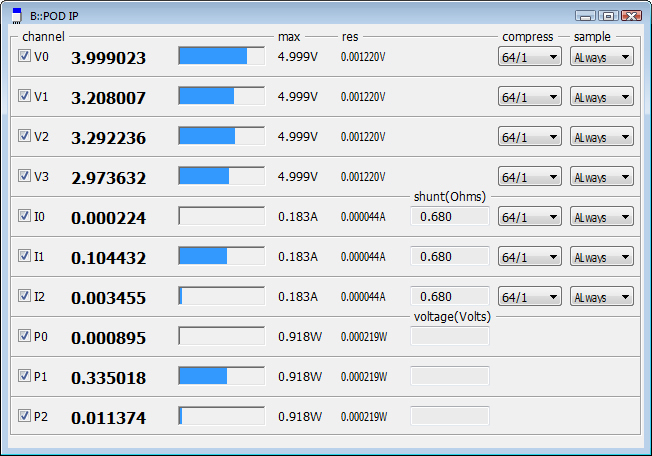 Power consumption over free defined Groups. 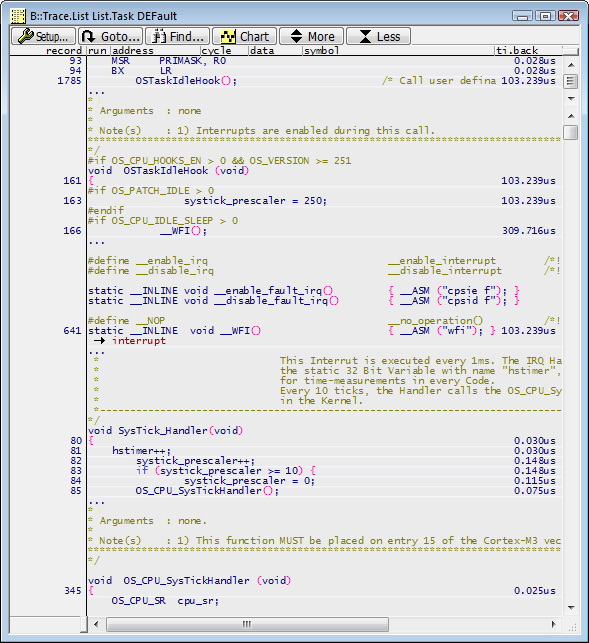 In this Example Groups reflects the Code for Kernel, Application and HAL Interface.